On a quiet day you can hear David Hazelwood’s mind ticking over. Not because it’s chugging away slowly like a V-twin Harley or just about out of oil, but because he’s forever thinking, thinking, thinking of new and clever ways of making his Wedgetail Camper unit even better…if that’s possible. I would hate to have been part of his household during the six years it took to get the design right, followed by the two years to build the prototype, plus another two years of further R & D before finally releasing his innovative product to the public – that’s 10 years of brain-noise-pollution. Having said that, David has made every effort to reduce the environmental impact right through the build and usage stages of his camper unit. His slide-on camper unit weighs from 420kg to 600kg (depending on how many option boxes you’ve ticked) plus your personal gear. David’s approach to his project was one of delivering a unique product that had clever, useable design features that made set-up and pack-down quick and easy, plus provided as many mod cons to the camper as practical to make life on the road all that much easier. That, combined with being able to be carried on most utes; you don’t need a big boofy Cruiser, Defender or Patrol, the Wedgetail can be carried on most mid-sized utes – Ranger, BT-50, HiLux, Navara, Colorado and so on – leaving you with a more ‘car-like’ 4WD to trot around with when not out touring. David has had his fair share of touring with camper trailers, trying to park in crowded car parks or main streets of country towns and the associated problems. He’s also been stuck midway through mud, sand and river crossings and had to unhitch the trailer to recover the lot… get the idea, he has developed a dislike for towing and figured there’d have to be a better way. He wanted to be self-sufficient with regard cooking, refrigeration, shower, toilet, in-built heating, as well as the convenience of a caravan park but wherever he wanted to camp in the bush. Next, he wanted a decent amount of room for himself and his good wife for both indoor cooking and living with the option of using not just the kitchen but every other convenience either inside the camper or outside. Problem was, no one offered what he wanted and hence the product you see here. Not hard to understand why he couldn't purchase ‘off-the-shelf’ eh! Too long a wish list! While most campers tend to want to cook and live outside – makes sense when you’re out to enjoy nature – it’s not always pleasant to do so. Hands up who’s camped in the freezing cold, blustery gales, fly and mozzie infested sites or just wanted a little privacy from others…admit it, you just wanted the convenience of cooking, showering or crapping on the dunny in the comfort of your own enclosed camper eh? David has thought long and hard as to where all the required camping gear is stored in his unit. It’s obvious the heavy gear should be stowed low and forward, while the lighter and bulky gear to the rear and up higher. Ticks all round for his efforts here, which is especially important when using the Wedgetail on an extra cab style of 4WD like the BT-50 to keep as much weight as possible forward of that rear axle. While there are some incredibly clever design features in the Wedgetail, the one that takes the cake for me is the slide and rotate fridge system. From outside, you slide the 80 litre fridge out (it’s been mounted length ways in the camper to save room), then spin it 90 degrees to save room while in use outside next to the kitchen. To keep the fridge compartment (as well as the entire camper) dust free while travelling, free-flowing air passes through the front-mounted vent and air cleaner, then wafts over the fridge (taking the fridge-generated hot air with it) and pressurises the entire camper unit. David reckons he can have the complete kit set up in eight minutes by himself. Looking inside you’ll see a plethora of poles holding all the canvas taught to prevent flapping or pooling with water. While it may look overwhelming, every pole simple clips, swivels or snaps into position making the whole process relatively easy - gee he’s a clever clogs! David was steadfast in his desire for plenty of head room to provide a sense of spaciousness in his set-up camper – hence the ‘Tardis’ statement at the top of this yarn; it’s damn huge inside with a full queen sized bed, table, padded chairs and access to everything - especially with the seven large vista-inducing windows with both mesh, canvas and plastic covers. While large ‘cat-swinging’ events may see a few tails knocking ornaments around, there is plenty of room for two on camping trips. More than two would be a squeeze, but extra bodies could sleep on the floor in the isles or even under the outside awnings when set up. Who’s tossed and turned and been to cold while trying to sleep? Not in this Wedgetail you won’t! Ya’ see, not only is there a diesel-powered heater that uses just 10 litres for up to 100 hours of use, there’s also polystyrene insulated walls and bed base sandwiched between the marine grade aluminium skins to retain internal heat and keep the outside cold air out. Should you wish to set up camp for longer periods of time and have the use of your 4WD, David has devised his own jacking system to easily and safely allow the Wedgetail camper to be freestanding. The whole unit becomes sturdily locked onto the legs. The same jacking legs come with dolly wheels to make storage and moving easy when back in your garage – jack it up, drive away, lower it down and wheel it to the most appropriate spot in the shed – brilliant! Note that huge rear pod – yep, that’s one of the reasons for the name of ‘Wedgetail’, but it also doubles as a storage section for light, bulky gear like chairs and tables, plus houses the hand rail for the scissor-action drop-down stair case – now that’s flash! Once that rear pod is effortlessly hand-winched open, a second hand winch opens the gas-strut-assisted roof, which becomes the bed base. It’s these two opening sections, in combination with the canvas tent design that allows for so much internal space. Having spent some time with David and been shown every single nut, bolt, clever design feature and mind-boggling double use of most components, I’d have to say he’s ticked every box on his extra long wish list. The ability to camp just about anywhere regardless of ground condition (you’re standing and sleeping up high off the ground remember), as well as not having to tow a trailer, which also allows for keen fisho’s to haul their larger boats around makes touring with a slide on camper a tempting alternative. David also points out that as it’s a slide-on unit designed for flat bed trays, it can also be easily adapted to flat bed trailers if required – another doubling-up of use... it never ends with the Wedgetail! 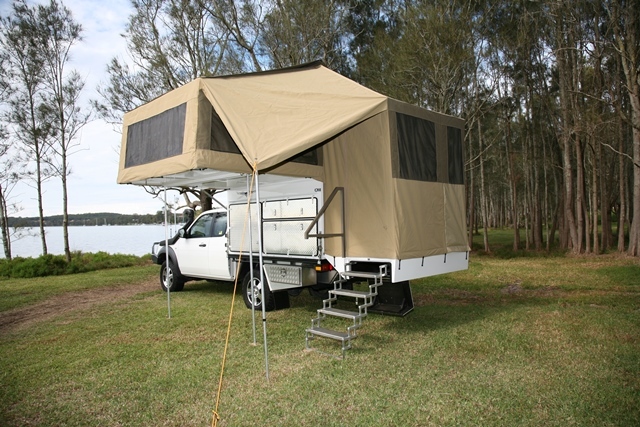 For more information and a full list of optional extras visit www.Wedgetailcampers.com.au or call David on 0458 493 917. There’s also a video to demonstrate the Wedgetail being set up.